hidden and despised, whereupon we esteemed him not." The Agony in the Garden is such a sad event. It's when Jesus sweat drops of blood in the Garden of Gethsemane and has been often depicted by artists throughout the ages. While meditating on this Sorrowful Mystery, you may find it helpful to view some pictures of this sad event or even listen to some music that will put you in the meditative mood. 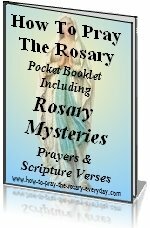 It is the first of the Sorrowful Mysteries of the Rosary prayers. As you meditate on this mystery you should feel a true sorrow for the sins you have committed, for they too contributed to the emotional pain Jesus suffered. Following the Institution of the Eucharist at the last supper, Jesus takes His disciples to an olive grove, called Gethsemane. He tells most of them to stay behind while He leads Peter, James and John further into the garden to pray. The Bible says Jesus "began to grow sorrowful and to be sad." He reveals to Peter, James and John, "My soul is sorrowful even unto death". He tells the three of them to stay behind and watch as he goes further alone to pray. Jesus falls upon his face in an agony being overwhelmed by what He knows He must suffer the next day in atonement for the sins of mankind. He prays to God, "My Father, if it be possible, let this chalice pass from me. Nevertheless not as I will, but as thou wilt." Returning to Peter, James and John, who have fallen asleep, Jesus somewhat disappointed asks them, "Could you not watch one hour with me?" He tells them to pray that they will be guarded against temptation. Then He leaves them once again and goes off alone once more to pray. Again He prays to God saying, "My Father, if this chalice may not pass away, but I must drink it, thy will be done." Once again Jesus returns to Peter, James and John. And once again they have fallen asleep. He leaves them for a third time and prays the same prayer and this time upon returning and finding them asleep Jesus says, "Sleep ye now and take your rest; behold the hour is at hand, and the Son of man shall be betrayed into the hands of sinners." The soldiers take hold of Jesus and all the disciples run away abandoning Him. Jesus is then taken to Caiphas, the high priest where many people are already gathered awaiting Him. The Bible passages of Jesus' Agony were taken from the timeless Douay-Rheims Catholic Bible. If you are looking for a more modern language version of the Agony in the Garden, our recommendation would be the St. Ignatius Press Bible. Most of what is recounted above about the Agony in the Garden, can be found in St. Matthew's Gospel in Matthew 26:36-57. You will find at different times in your life, different things will inspire you. Something that you dismissed today may seem profound to you in a week, a month or even in years to come. Below you will find some more reflections on the Agony in the Garden mystery of the rosary. Jesus again singles out Peter, James and John as He did at the Transfiguration. Jesus, at the Transfiguration revealed His glory to them in order to strengthen them for this suffering that was to come. Jesus went off alone to pray. It is important for you to have quiet, secluded time to speak with God. In the Agony in the Garden, Jesus' suffering was so great that He sweat drops of blood. He experienced serious emotional and mental suffering. It is a great comfort to know that Jesus knows how real mental suffering is. Think of this if you are ever suffering in this way. Jesus was leading by example here. He was allowing Himself to experience this great agony to demonstrate the proper way to confront suffering in your own life. He is showing you to turn to God in prayer at these times. He is also telling you how to pray. Ask God to relieve your suffering but also be open to His will for you. Poor Jesus, His close friends couldn't even stay awake to pray with Him as he went through the agony in the garden. Are you too busy to spend time with Him in prayer? Jesus fell prostrate to pray. Some attention to your posture in prayer is necessary. Your mind and your body unite in prayer. Kneeling helps you focus on your prayer. Falling upon your face, or prostrate is a humble and penitent posture for prayer. "Watch ye, and pray that you enter not into temptation. Prayer is an integral part of your spiritual life. The apostles did not pray. They slept. Then they lacked courage the next day and abandoned Jesus during His Passion. Incorporating the Rosary into your day is beneficial and fulfills an essential role in your spiritual growth. If you don't pray, you will not find peace. You should imitate His persistence when you pray. Not all prayers are answered right away. God's time is not our time. Because Jesus possessed a human nature, He experienced the same emotions and feelings you and I experience except for our inclination to sin. He suffered much because His human nature didn't want to experience the sufferings that lay ahead. Especially because these sufferings were in expiation for the sins of humankind. His sorrow was compounded by the knowledge that so many would be ungrateful and not accept His grace. God the Father is a just God. In justice, the debt owed by the sin of Adam had to be paid. Jesus took this debt upon Himself and began to suffer the price at this point in the Garden of Gethsemane. For the redemption of humans, he was entering the way of the cross. 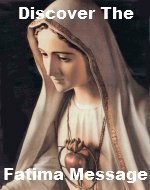 It is not far fetched to assume that Mary also suffered greatly at this time. She was not in the garden with Jesus but so closely are their hearts united that at this time she too must have suffered greatly. How much she must have desired to be there to console Him, to wipe the drops of blood that He sweat in His agony. I am sure He too wanted her to be there to comfort Him. After His agony, surely Jesus warned His apostles what was to come and asked them to look after and comfort His mother and the other holy women who followed Him. Jesus abandoned Himself totally to the will of the Father. Totally abandon yourself to the will of God. Take a serious examination of yourself and bravely look at the areas in your life where you need to yeild your own will so as to live totally abandoned to the will of God. This is a crucial step on the path to true peace. In the Garden, Jesus devoted Himself to the sufferings that were to come. He did this not for humans as a whole, but for each one of us individually. He embraced suffering for you. And if you were the only person in the world, He would have just as willingly accepted His cross. Dear Lord, praise and honor to you for your agony in the garden. Thank you for bearing so much suffering and discomfort for me. Please forgive me when I don't want to do something that seems to me very difficult, or even the simple duties in my life that I feel are just too hard. Let your sufferings be a constant reminder that I can suffer just a little bit and offer it up in union with you. Please comfort me in my times of affliction. Help me to realize that my suffering is nothing compared to what you did for me during your Agony in the Garden. Guide me through all my trials in life and let me never be seperated from you when I feel my suffering is too much to endure.